I’ve been investing with Lending Club lately. Lending Club is a form of P2P lending. In short, you’re lending more directly to the borrowers requesting loans. Since there’s less overhead, the investor gets a higher interest rate (with some increased risk) and the borrower gets a lower interest rate on his/her loan. I’ve spent a lot of time going over the data provided by Lending Club. I’m fascinated to see what kinds of interesting information I can get out of the raw data. For example, there is a more than 95% probability that a loan that has repaid more than 65% of it’s principal will repay fully. In other words, you really don’t have to worry nearly as much once the loan is past 65% repayment. Statistically significant in regards to repayment? All of these are pretty much what I’d expect with the exception of the last two. I was avoiding borrowers with a lot of open credit lines or who hadn’t been employed very long. It’s good to see that this prejudice was unjustified. Confidence factor can be a little confusing. For example, the confidence factor for “Loan Purpose” means that there is less than 0.01% chance that the differences between the observed and expected values of loan repayment for the loan purpose were caused by random chance. That’s why we are more than 99.99% confident that there must be some underlying reason other than chance that the data differed. This does not include any notion of how or why the loan purpose matters to loan repayment, only that it does. These values were calculated using a Chi-square test. I took all the loans that were either fully paid, defaulted, or charged off. I further broke the loans down into two results: loss, which included all loans that had repaid less than 94% of the loan’s principal, and gain, which included all loans with more than 94% repayment of principal. I only took categories that had more than 300 loans in the set. With smaller numbers you risk having your results greatly impacted by random chance. For example, only seven of the thirty-five credit grades met this criteria (A4, A5, B2, B3, B4, B5, and C1) and only four states (CA, FL, NY, and TX). Since we’re only interested in knowing whether different credit grades or states impact the likelihood of repayment, this restriction is fine. If you’d like to see the expected vs observed tables for these results, you can grab here:Â Observed vs Expected Tables. Hopefully I’ll find time to talk about future findings! A lovely remake of Spacewar! For those who aren’t familiar, Spacewar! is the second video game ever made. It took the original programmer 200 hours to create on a DEC PDP-1. Obviously technology has advanced a lot since when it was first created, so I thought it would be the perfect game to develop for ACM. 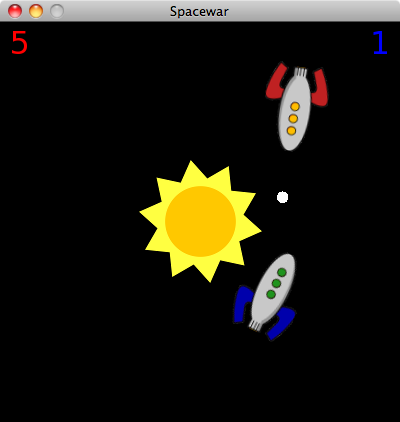 Over the course of two sessions at one hour each session, I was able to create a viable remake of Spacewar! using Lua and Love. The controls are the arrow keys for ship 1 (red) and wasd for ship 2 (blue). Running into the sun kills you, and each time you die (from anything) you have two seconds of immunity from dying. This immunity prevents spawn camping. I’d like to thank zerohdog on flickr for the ship image and fastcall for the sun image (also listed in credits in the game). I’ve been wondering if it was possible to make a MySQL/SQLite/Flatfile abstracted interface for Lua for some time now. At first I thought I’d try something like LINQ, but realized that there was really no reasonable way to do that in Lua since we don’t have the power of expression trees. I then considered writing the queries in a simplified pseudo-Lua language, but that would take too much time to parse and no one really wants to learn another language anyways. What I settled on instead was a very simplified abstraction of the data access. It can’t do everything you can do yourself from SQL or raw file I/O, but I found that it serves up exactly the kind of interface I’d need for all my past projects in Lua that use some form of I/O. The API around such a clean representation of data couldn’t be much simpler. You have four operations: insert a new row by primary key, fetch an existing row by primary key, delete a row by primary key, and get the entire table. When inserting a row you can optionally pass in the data for the row. 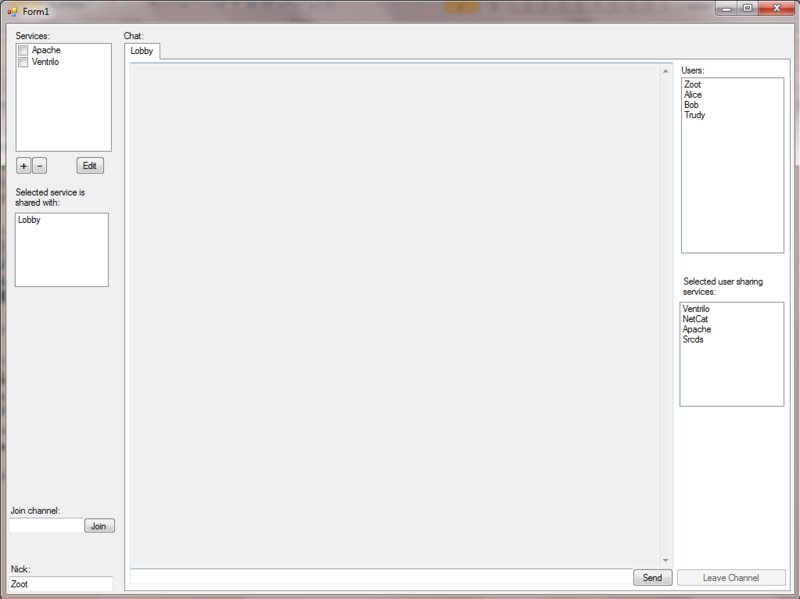 With both the insert and fetch functions you get back a table for the row that’s being “tracked”. When you change any of the contents, the change is immediately reflected into the DB or file. There’s a caching system built around the system so if you fetch the same row multiple times, it won’t be going out to the DB or reading the file each time. You can request the cache be flushed or disabled altogether if you need to. Unlike file I/O I’ve done in the past, this system doesn’t need to parse the whole file to get a single row, which means it should probably work okay using flatfiles on very large files. Though I haven’t coded this portion yet, I’m also planning on adding the ability to convert between MySQL/SQLite/flatfiles on the fly. This may be problematic for very large databases, so I’ve also taken care to make sure that this system can be run as a standalone script apart from any specific application. So… if you’ve read this far, your next question is probably, “Why bother with such a system? Why not just stick with a single format?”. A single format (usually flatfiles) is great for about 95% of my users. The other 5%, however, are the power users who want to do crazy things like hook up a PHP billboard with blinking lights showing how many times a second someone says the word ‘the’. It’s the power users I prefer to cater to, so I’ve always felt guilty in the past that this was one area I couldn’t do much for them in. But now I can! I stumbled across Levenshtein distance today and had to try my hand at writing an implementation in Lua. I choose the slightly more complex Damerauâ€“Levenshtein distance, and I think it turned out pretty well. Complexity is O( (#t+1) * (#s+1) ) when lim isn’t specified. This function can be used to compare array-like tables as easily as strings. This function is case sensitive when comparing strings. Using this function to compare against a dictionary of 250,000 words took about 0.6 seconds on my machine for the word “Teusday”, around 10 seconds for very poorly spelled words. Both tests used lim. edits needed to transform one string or table into the other. s – A *string* or *table*. t – Another *string* or *table* to compare against s.
not return a higher number than lim, if specified. :EditDistance( “Tuesday”, “Teusday” ) — One transposition. :EditDistance( “kitten”, “sitting” ) — Two substitutions and a deletion. * Complexity is O( (#t+1) * (#s+1) ) when lim isn’t specified. * This function can be used to compare array-like tables as easily as strings. off number of subsitutions, additions, deletions, and transpositions. * This function is case sensitive when comparing strings. spelled words. Both tests used lim. — that row and column indices start at 0 (we’re starting at 0). — Is this eligible for tranposition? Gist of the same source code. 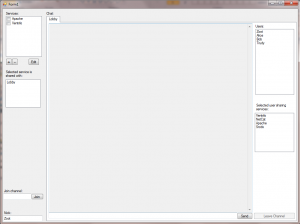 Designing the GUI for NetTunnel put my creativity to the test. I’ve never actually designed a GUI before, but I’ve seen and read a lot about GUI design theory, but theory seems to be fairly pointless for this design process. It was interesting for me to try to translate the idea in my head to the controls given in Visual Studios. A much cleaner and easier to understand layout. 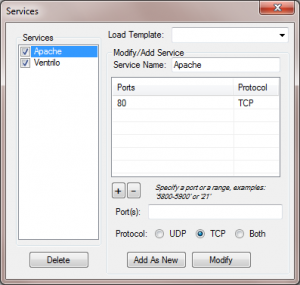 Services can be toggled just by clicking on the ‘service’ menu and then clicking on the appropriate service from the drop-down, or they can be toggled within the service window proper. 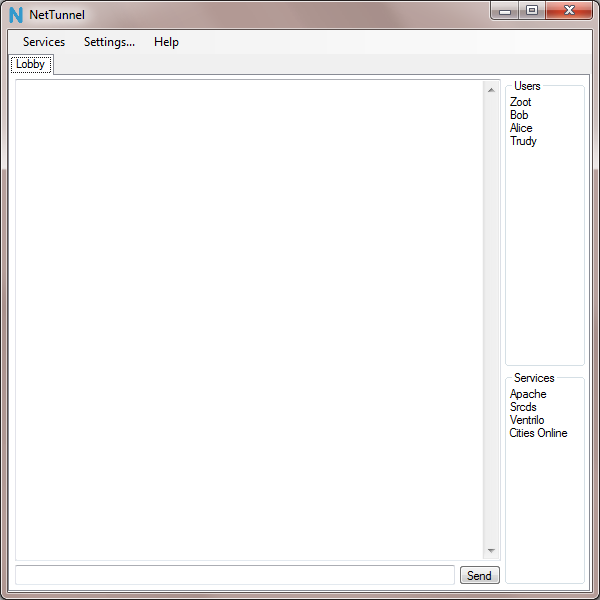 All the most commonly used items in the gui are put in obvious places, while making sure that everything’s just a few clicks away. Everything resizes and can have the size proportions for it changed. Now that I know how easy it is to create GUIs, I think I might start using them in future projects while retaining a command line version for power users. As part of my requirements for obtaining my degree, I’m doing a network capstone project this semester.Â I’ve always been somewhat fascinated with NATs and specifically, how to break them, so I decided to work on a NAT traversal application. 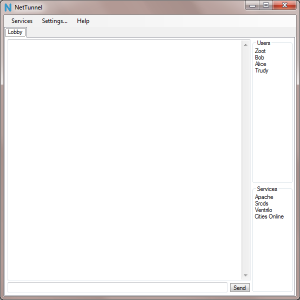 Enter NetTunnel: The purpose of NetTunnel is to provide a means for users with a lack of knowledge of networking or on a restrictive network an easy and simple means to share network services with other users. Basically, say I’m on a restrictive network (like the dorm network) that does not allow me to host servers with the world due to NAT restrictions. I want to run ventrilo on my machine and have my friends join so I can chat with them. Unaided, this would be impossible, but if my friends and I are running NetTunnel a “hole” will be opened up in the network so they can connect. 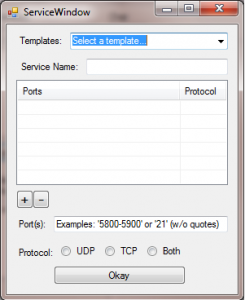 It’s a pretty simple concept that’s already done in most modern desktop applications like Skype and peer to peer games. As far as I could tell this idea’s never been extended to a general level like NetTunnel, so there is a definite need for it. The closest application to it I could find is GameRanger, though GameRanger is aimed specifically at games. I’ve set up a quick static page for NetTunnel at nettunnel.nayruden.com. Keep an eye out for further development, and I’d love to hear feedback about it! While talking to LightSys, an organization that offers free IT services to mission organizations, I was told about the Christian Open Development Network or CODN (pronounced codin’). The site is in dire need of a refresh and a core community (last update is 2005?!). I felt like God was nudging me while they described what they wanted CODN to be, especially since what they need is exactly what I have experience with from managing the Ulysses community. So, if you or any friends are interested in Christian open source development, be sure to watch the site over the following months as we work on it. If you’ve got any ideas on what you’d like to see there, be sure to drop a note in the comments. We’ve been evaluating D for use in Daydream, and I decided to see how easy it would be to create a callback system in the DÂ language (aka events or signals). This is a daunting task in C++ because C++ templates can only accept a static number of arguments… very bad when you have a function that can accept any number of arguments. To solve this problem in C++ you need to create a separate template for each number of possible arguments. In D you can create templates that accept any number of arguments! You can treat these as a tuple, an array, or use them with tail recursion (Ã la PROLOG). Combine this with the natural awesomeness of D and you’re setup for a power punch. Following this text is a very simple callback system in D.
A short but sweet 50 lines of code; it stores both functions and delegates and gives you a good launching point to create a more complicated call back system.